Investors desirous of quick gains from their investments have invested about N99.50trillion in short-term money market instruments in seven months on the platform of the FMDQ OTC Securities Exchange market. According to figures provided by the FMDQ OTC Securities Exchange in August, total turnover for the January to July 2018 period amounted to N99.49 trillion. As usual, trading activities in treasury bills contributed the largest to overall turnover, accounting for 40.4 percent of the market. The foreign exchange market transactions (Spot FX and FX Derivatives) accounted for 37.0 per cent whilst the Repos/Buy-Backs product category accounted for 15.39 percent of overall market turnover. Bonds and Unsecured Placements & Takings, which contributed the least to overall market turnover, accounted for 6.65 per cent and 0.54 per cent respectively. Further breakdown of trading activities in the market in the review period showed that investors splashed about N40.19trillion ($111.41billion) on treasury bills while FX attracted about N23.77trillion or $65.88billion. Repurchase Agreement/Buy- Backs got N15.31trillion ($42.44billion). Foreign exchange derivatives attracted N13.04trillion or $36.15billion from investors. Investment in the federal government bond stood at N6.49trillion or $17.98billion in seven months. Average daily turnover in the market in the review period was N681.47billion or $1.89billion. Top 10 banks, which include Stanbic IBTC Bank Plc, Access Bank Plc, United Bank for Africa Plc, Standard Chartered Bank Nigeria Limited, Ecobank Nigeria Limited, accounted for 76.23 percent (N75.85 trillion) of the overall turnover in the market. Other dealing banks in the top 10 category include Citibank Nigeria limited, Guaranty Trust Bank Plc, Union Bank of Nigeria Plc, Zenith Bank Plc and First Bank of Nigeria Limited. Meanwhile, the top three dealing banks accounted for 58.13 per cent (N44.90 trillion) of this sub-section of the market. Stanbic IBTC Bank Plc, Access Bank Plc and United Bank for Africa Plc were the leaders in the value traded for the overall over-the-counter (OTC) market, ranking first, second and third respectively. Managing Director/CEO of FMDQ, Mr. Bola Onadele.Koko, disclosed that FMDQ had accomplished a full and clear revival of the Commercial Paper (CP) market with registered CP Programmes on the FMDQ Platform now well above N1.0 trillion. “The month of August saw key activities in the CP quotations space on the OTC Exchange, wherein the N100.0 billion CP Programmes of Union Bank of Nigeria PLC and Flour Mills of Nigeria of PLC respectively, were registered on the OTC Exchange’s platform,” he added. Onadele.Koko noted that as these institutions and a host of others continued to effectively and sustainably meet their funding needs, as well as contribute to the development of the nation’s debt markets, FMDQ continued to take crucial steps, in collaboration with market stakeholders, towards promoting transparency, governance, integrity and efficiency in the Nigerian CP market. Also in August, the Board Listings, Markets and Technology Committee of FMDQ granted the approval of the C & I Leasing Plc N7.00 billion 5-Year 16.54 percent Series 1 Fixed Rate Senior Secured Bond (the “C & I Leasing Bond”) under a N20.0 billion Debt Issuance Programme on its platform. 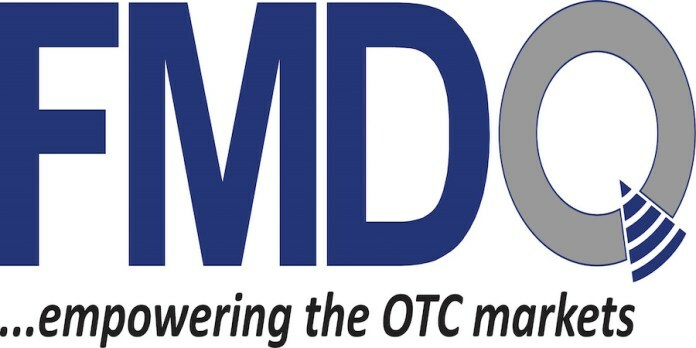 “In streamlining the efficiency of its processes and delivering value to both corporate and commercial businesses desirous of accessing the debt capital markets (DCM), FMDQ has continued to avail its credible platform as well as tailor its Listings, Quotations and Notings services to suit the needs of issuers. The proceeds from the C & I Leasing Bond will largely be used to boost C & I Leasing PLC’s business expansion exercise and to restructure the company’s debts over a period of five (5) years”, the report disclosed. Onadele-Koko disclosed that by listing its bond on FMDQ, C & I Leasing Plc enjoyed exceptional benefits, which included, but were not limited to, enhanced investor confidence in the issuer, transparent/relevant information disclosure on the issue, effective price formation and global visibility. Beyond the activities of investors in the market in the review month, the visit of British Prime Minister, Ms. Theresa May, to the FMDQ OTC Securities Exchange in August marked a high point of events since the creation of the market. May visited Nigeria as part of her Africa tour to improve trade and investment relations between the United Kingdom and Africa. The British Prime Minister, on her first official visit to Lagos State, was welcomed by the FMDQ Board Chairman, Dr. Okwu Joseph Nnanna, ably represented by the Vice Chairman of the Board, Mr. Jibril Aku, and the Managing Director/CEO of FMDQ, Mr. Bola Onadele. Koko to Exchange Place. This deliberate effort to strengthen bilateral relations between Nigeria, and Africa as a whole, with the UK is indeed commendable and most welcome. “The Nigerian financial markets play a crucial role in promoting and supporting sustainable economic development over time, therefore, the choice of FMDQ for the hosting and reception of the British Prime Minister, UK and Nigeria business sector leaders and other executives from the British High and Deputy High Commissions in Nigeria, among others, was in no way far-fetched”, the FMDQ CEO disclosed. He disclosed that chief amongst the attractions for the British PM at FMDQ’s offices, Exchange Place, was the FMDQ Next Generation Empowerment Programme (FMDQ-Next) – a learning and development initiative which promotes financial market education among students across all levels (primary, secondary and tertiary), as well as fresh graduates, within the country. “The British PM met with the FMDQ-Next 2018 Summer Camp participants who were being taught principles of financial markets and how to trade various financial markets securities in a simulated trading environment – the FMDQ Q-Hub”, he added. Also, of interest to May and the UK delegation was the depiction of the evolution of FMDQ from its launch onto the Nigerian financial markets landscape up until date vis-à-vis the achievements made by the OTC Exchange so far in its quest to transform the Nigerian financial markets to be globally competitive. Be the first to comment on "FMDQ: Investors Splash N99.5tn on Short-term Instruments"